Marvel Rising- A Miniseries Deserving Of An Ongoing Title! Today we have a treat- Michael from My Comic Relief kindly wrote us a marvelous guest post to cover Nancy’s absence while she and her family vacation in Washington DC. After you read this post about the new Marvel Rising, make sure you check out his site and be ready to be impressed with his posts about comics, Star Wars, music and his poignant New American Resistance series. Enjoy! For several years in a row, I have brought Free Comic Book Day to my library. I pick up a good selection of titles from my favorite comic book store, Graham Crackers, and offer them to the library patrons when they come in. I also had some Star Wars and superhero crafts available for kids to do as well. I know, I know…I’m pretty awesome to offer such epicness to my library community. As an added bonus, I love getting a sneak peek of the titles, and this year I went a bit crazy and picked six. But…none of them wowed me, as I think last year’s selection was better. Now I know comics can’t always follow whats going on in the movies, but having two Avengers stories that don’t correlate with what many of us saw on the big screen is confusing. In the first story, Black Panther and Odin, Thor’s father, talk of a threat that has been hidden for a million years. We get flashbacks to six God’s from the past that must be ancestors to modern day superheros. It’s hopelessly muddled and doesn’t make sense at all. The second story about Captain America is penned by Ta-Nehisi Coates, and picks up where last year Hydra’s story ended. This second story has some possibilities. A lighthearted romp with Han and Chewie getting into a scrape and then out of it. Typical Han Solo antics but the character is drawn with a face that looks more like actor Alden Ehrenreich than Harrison Ford. A nice tie with the upcoming Solo movie, but it didn’t advance his story line at all. This version of Bond isn’t drawn to resemble any of the past cinematic Bonds, and that’s just as well, as not to muddle our perceptions of him. 007 is being sent out on a mission, and due to some new regulations will not have his gun on him while he travels. This issue is a prequel to a future story, and humanizes James as he prepares to leave on this new job. The story and the clean art seem promising. I picked up this title thinking the cover looked pretty cool, before I realized it was a Captain Canuck story. I almost put it back down after that realization, but then I would have missed the awesomeness of Canadian Trudeau, American Trump and Russian Putin facing off against one another at a United Nations General Assembly. Trudeau is portrayed as the voice of reason (true in real life) while Trump especially gets a comical (also true to form) depiction. Go Captain Canuck- save our world from alien invasion! I am not a fan of steam punk at all, but I picked the title up as I needed some female representation in my selections. This issue has two stories set three years apart, and is filled with the tired tropes of Mechanika having to find her origins, but as soon as she finds a clue, something prevents her from following it. This bionic female is sexualized with completely ridiculous outfits. Although the artwork is absolutely beautiful, I could not get past her comical vest that pushed out her breasts. Come on now. This final story was a last minute grab for me, once I saw that it is an 80’s coming of age crime story, as I’m a sucker for that era! The opening story line appealed to me, as Diego works at a mob owned business, and (true story) I’m almost positive I worked at a clothing store that was a front for the mob when I was in high school. The plot then veers into cheesy 80’s movie territory with the story of a nerdy boy who wins over a hot girl. It was cute, but I don’t know where the continuing story will go. Also, the stylized cover doesn’t adequately represent the art inside, it’s completely different. I don’t like bait and switch. So, I really question if I will continue with any of these stories. While I didn’t hate them, none grabbed my attention enough to make me rush out for future issues. Time will tell. Rainbow Rowell and Kris Anka bring the Runaways back together in this promising re-boot! The X-Men regroup after the devastating Phoenix event in Avengers vs X-Men, with Cyclops taking the lead of his outlaw band of mutants and establishes the New Charles Xavier School. He, Emma Frost, Magik and Magneto collect new students from around the world, as new cases of teens gaining abilities out of nowhere are popping up all over. The Avengers hear of Cyclops’ mission and try to stop him. Being partial to the X-Men, I feel that the Avengers came off as pricks with a holier than thou vibe. They got shown up when one of the new mutants used her powers to trap them, and the X-Men made their escape. The team head to the Jean Grey School for Higher Learning where they meet up with Kitty Pride, Wolverine and Havok who are leading a second school for mutants. Their differences are established, and it is sad to see such divisions among the former teammates, but a few students there switch over to Cyclops’ new school. In the midst of this, we learn of a mole in the Uncanny team, and later are unsure if this team member is being truthful, or if there will be further double or triple crosses. Cyclops is torn about what he did to Professor X, and his culpability level as his, Emma’s and Magneto’s powers were compromised by the Phoenix. They need the new mutants as much as the new students need their guidance. The last chapter concentrates on Magik and her connection to Darkchild and the demon world. A cliff hanger is set up and this new team have their work cut out for them. Right off, I was at a disadvantage as surprisingly I have not read A vs X (it is now on reserve for me at my library), so I struggled with my background knowledge. 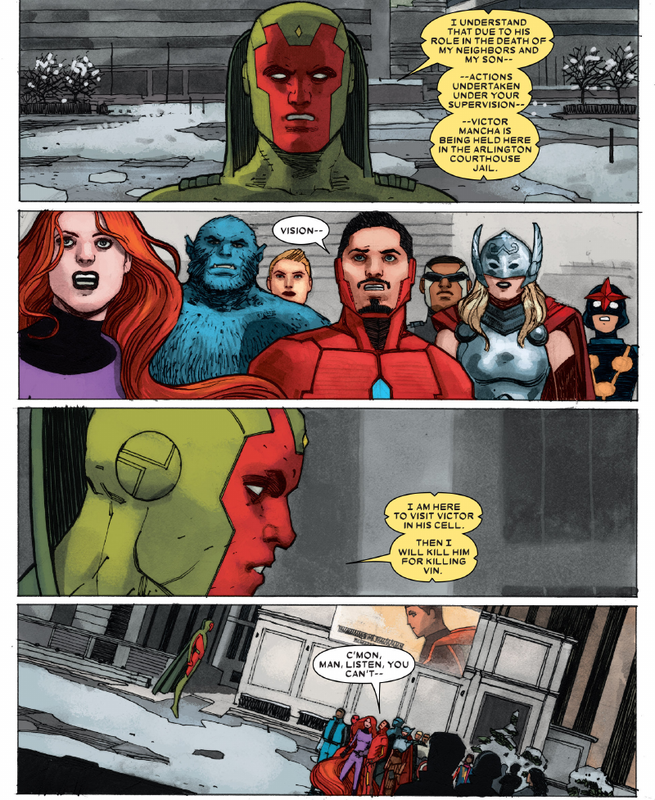 Most comics, including this one, try to fill the reader in on past events through dialogue between characters but I had to search some Marvel Wiki pages for info to fill in my knowledge gaps. What I probably should have done, is set this book aside until I read the other book, but I was on a time crunch and soldiered on. Artist Chris Bachalo illustrates chapters one through four, while Frazer Irving takes over for chapter five. As the style changes dramatically in the last chapter, and not for the better, I was not happy. I liked Frazer’s backgrounds better with his swirling colors, but Bachalo’s illustrations of the heroes was far superior. If I am to read further into the series, first I must read A vs X, and then see if the art holds up in future volumes. Bendis, Brian Michael, Chris Bacalo & Frazer Irving. Uncanny X-Men: Revolution. 2014.